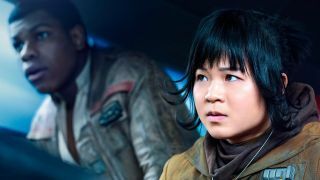 Rose Tico is one of the brand new characters we'll meet in Star Wars: The Last Jedi, and actress Kelly Marie Tran's recent interview with SFX magazine reveals that - like the rest of the world- she's a big fan of Finn, stormtrooper turned Resistance hero. "When Rose first meets Finn, Finn is already a hero of the Rresistance, so she’s heard about all his adventures from The Force Awakens, and when she first meets him she’s kind of a fangirl about it," she tells SFX. "But as the film goes on you get to see what it means to meet a hero, and actually realize who they are. Their relationship sort of morphs throughout the movie that way." We also learn a little bit more about Rose herself. She's a maintenance worker for the Resistance, and Tran describes her as a "smart, brave and loyal" person. "She’s not a princess, she’s not a superhero. She’s in the Resistance, and she is aware of things that are happening, but she’s always been someone who’s worked behind pipes, fixing things. She’s never been someone who’s been at the forefront of the action, but in this movie she gets pulled into it"
Check out our Star Wars: The Last Jedi info for everything you need to know about the upcoming movie. And make sure you pick up a subscription to SFX Magazine for more exclusive stories about the film before it hits theaters in December.